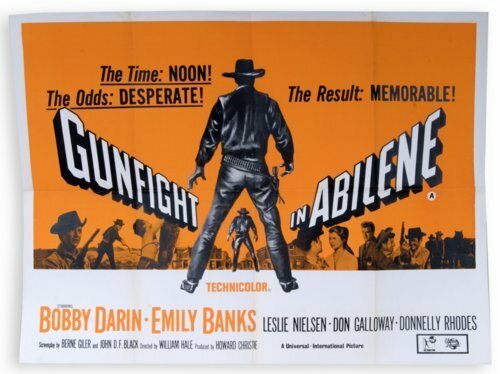 One-sheet poster advertising the movie "Gunfight in Abilene." The poster is printed on heavy white paper and has a horizontal orientation. The film starred Bobby Darin as a sheriff who refused to carry a gun, until a townsperson is killed in a skirmish between local farmers and ranchers. It premiered in 1967. This poster is part of a large collection of Western film posters donated to the Kansas Museum of History in 2007. All of the posters represent films with a Kansas connection.